That didn't last long, thankfully. Although baseball is still going on in the American and National League Division Series, the prospect-heavy portions of the sport have been off since the Triple-A National Championship Game on Sept. 19. That ends Tuesday with Opening Day of the Arizona Fall League season. Seen as a finishing school for young talent, the AFL groups together some of the best prospects in the game into six teams -- five Major League organizations per team -- over a six-week schedule in which they measure themselves against peers they may not have seen yet in the traditional Minor Leagues. Eleven of MLB.com's Top-100 prospects highlight this year's batch of Fall Leaguers while dozens more will be building their own cases to make the next jumps in their careers. Strength: Lineup -- This spot will have more of a positional taste further down the list, but the whole Javelinas lineup will be so good it deserves a full mention. 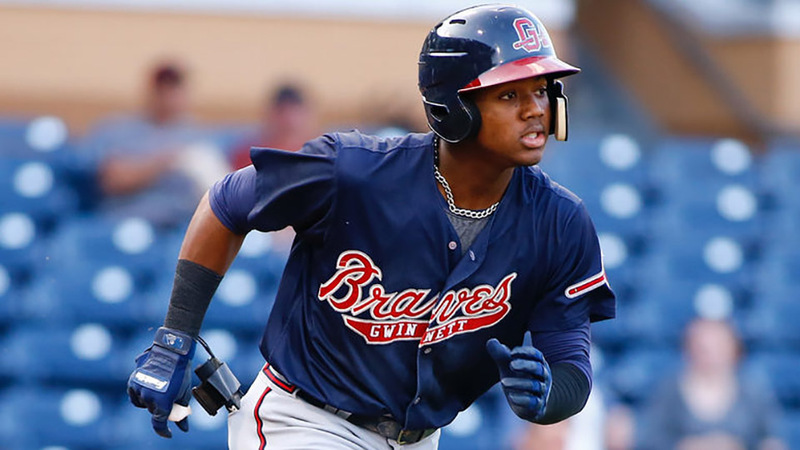 Any lineup that includes Acuna is going to be worth watching after the 19-year-old outfielder hit .325/.374/.522 with 21 homers and 44 steals across three levels during the regular season. The same could go for Chavis, who broke out for 31 homers with a .910 OPS between Class A Advanced Salem and Double-A Portland. Urias has the best hit tool of the bunch and consistently walks more than he strikes out while flirting with .300 in each of his four Minor League seasons. Lewis is the biggest question mark since knee injuries have limited him severely since he was a Mariners first-round pick in 2016. But when healthy, he's got provide plenty of pop. It doesn't stop with the Top-100 contingent either. Third baseman Austin Riley was a Braves Organization All-Star after surging at Double-A. Mariners outfielder Eric Filia hit .326/.407.434 with a 45/65 K/BB ratio in the California League this season. Lourdes Gurriel will be on his biggest stage since signing a seven-year, $22-million deal out of Cuba last November. No matter who's playing and who's sitting, there will be plenty to watch up and down the Peoria batting order in the weeks to come. Weakness: Catching defense -- The Javs actually have some of the more notable catching prospects in the Fall League in Alex Jackson and Max Pentecost -- the sixth and 11th overall picks from the 2014 Draft -- but both come with some baggage. Pentecost has dealt with shoulder issues throughout his career and only just returned to part-time catching duty in 2017 while otherwise splitting his time between first base and DH. Jackson originally moved to the outfield in the Mariners system but became a catcher again following his November trade to the Braves. Both are solid hitters, but they will certainly be tested when they don the tools of ignorance -- both as they work with a cavalcade of new pitchers and try to limit the opposing running game. Peoria also have Javier Hernandez (Blue Jays) and Joe DeCarlo (Mariners) as listed catchers, but neither carries the same prospect cache. Wild card: Touki Toussaint -- Will this be the ultimate ascension of a separate 2014 first-rounder? The Braves No. 14 prospect is coming off his best Minor League season yet after posting a 4.53 ERA with 167 strikeouts in 145 innings between Class A Advanced Florida and Double-A Mississippi. He was arguably better in a seven-start stretch at the higher level with a 3.18 ERA and 44 strikeouts in 39 2/3 frames. With a mid-90s fastball and one of the best curveballs in the Minors, the 21-year-old right-hander could send his stock surging even higher if he carries his Double-A momentum to the AFL. His control will continue to be the focus; he walked 13 percent of Southern League batters, up from 9 percent in the Florida State League. The pieces have always been there to make Toussaint an electric arm, and the circuit will be a big test to see whether the right-hander has a chance to reach his high ceiling. Strength: Infield bats -- The biggest individual story on the Glendale roster will be Mejia's move to third base, and we'll get to that later. Regardless of how he does with the glove, Mejia's bat will provide a big boon in the middle of the Desert Dogs lineup, and it won't be alone. In fact, it'll be his fellow infielders who'll provide some serious thump. No. 3 Indians prospect and first baseman Bobby Bradley will be building on his third straight 20-plus home run season. Pirates middle infielders Kevin Kramer (.880 OPS in 53 games) and Cole Tucker (47 steals in 110 games) will try to make up for lost time after injury-riddled 2017 campaigns. (Update: Tucker has been removed from the Glendale roster as he continues to recover from a broken hand.) The outfielders -- namely the Dodgers pair of Diaz and DJ Peters -- have some thump too, but the infielders should be the biggest offensive contributors for Glendale. Weakness: Pitching -- This might sound a little harsh. The Desert Dogs have the highest-ranked pitching prospect in the league in Mitch Keller, who checks in at No. 18 on MLB.com's Top-100 rankings, and they should get a good amount from him after he threw only 116 innings during the regular season. But beyond his once-a-week outings, there won't be too much to get excited about here. The Pirates and the Phillies were the only clubs here to send top-30 pitching prospects to Glendale, the others being (Taylor Hearn, Brandon Waddell, Elniery Garcia and J.D. Hammer). Hearn might be the most electric of the bunch with his fastball in the upper-90s, but in general, there are more exciting Fall League staffs elsewhere this year. Wild card: Mejia's move to third -- The top Indians prospect has always been a catcher by trade. But with some questions remaining about his framing behind the plate, Cleveland wants to see how he could handle the hot corner, where he played one game for Double-A Akron before making the jump to the Majors. His arm, which is considered a plus-plus tool, should have no issue making the transition at the least. It still seems more likely that MLB.com's No. 13 overall prospect remains behind the plate, but with Jose Ramirez getting more looks at second base during the regular and postseason, there could be an opening for Mejia to join an already star-studded infield, should this experiment work out. Strength: Outfield -- This would have been an immensely more exciting group under the originally announced roster that included No. 2 overall prospect Victor Robles. Instead, Robles made the cut on the Nationals NLDS roster and was removed from the AFL in favor of No. 10 Nationals prospect Daniel Johnson. No matter, there's still a lot to like here. Tucker, the game's No. 7 prospect, is a raw jack-of-all-trades after he hit 25 homers and stole 21 bases at age 20 between Class A Advanced Buies Creek and Double-A Corpus Christi. Johnson (22 homers, 22 steals) was more of a surprise 20-20 club member one year after he was taken in the fifth round out of New Mexico State, but he should be a big asset defensively with his range and arm as well. No. 22 Cubs prospect Charcer Burks gives Mesa another plus runner. Any team that could have had Robles was obviously going to miss him, but the Solar Sox still have plenty in place in the outfield to keep things interesting. Weakness: Pitching depth -- The closest things the Sox will have to aces may be A's No. 8 prospect Logan Shore and Cubs No. 3 prospect Adbert Alzolay. Shore was a 2016 second-round pick out of Florida and showed swing-and-miss stuff and impressive control with 74 strikeouts and 16 walks in 72 2/3 innings at Class A Advanced Stockton. Shore has good movement on his fastball and his changeup earns plus grades, but a lat strain limited him from showing them off in what would have been his first full season. Alzolay -- another late-minute addition -- is coming off a big-time breakout year in which he posted a 2.99 ERA with 108 strikeouts in 114 1/3 innings at Class A Advanced Myrtle Beach and Double-A Tennessee. This will be a major test for him, both in terms of the competition and the pressure that comes with being the next big thing in the Chicago system. Otherwise, no Mesa hurler ranks higher than No. 14 in their organization. Wild card: Yordan Alvarez -- The 20-year-old left-handed slugger was looking like a Breakout Prospect of the Year candidate after he batted .360/.468/.658 with nine homers in 32 games at Class A Quad Cities, prompting a promotion to Class A Advanced Buies Creek. He wasn't nearly as good in the Carolina League with a 277/.329/.393 line and three homers in 58 games. So which version will show up in the AFL? Alvarez is listed as an infielder on the Mesa roster, but he's also split time between there, left field and DH. The Astros will likely want him to keep his versatility, but will Houston's No. 4 prospect be a liability when he's on the grass? Strength: Pitching -- Finally, a club in which the focus should and will be on the arms. Sheffield will be making up for lost innings after an oblique injury limited him to 93 1/3 at Double-A Trenton. Having spent almost the whole season in the Eastern League, this also will serve as a finishing school of sorts for the 21-year-old left-hander with a potential Major League debut coming in 2018. Getting more swings-and-misses against advanced hitters should be a priority, and Sheffield has the four-pitch mix to make that happen. Though the Yanks southpaw is the only Top-100 pitching prospect in the AFL besides Keller, there remain other arms to watch with Scottsdale. Giants No. 3 prospect Tyler Beede may have gotten a Major League look after amassing 109 innings at Triple-A Sacramento before a groin injury ended his season on July 25. He'll have a lot to prove after posting a career-high 4.79 ERA in the Pacific Coast League. Dillon Tate would have made for an interesting hurler in his second AFL season, but he was replaced at the last minute. Instead, No. 7 Yankees prospect Albert Abreu moves in to take his place. The 22-year-old right-hander didn't get much time on the field in his first season in pinstripes but showed good stuff with 61 strikeouts and 18 walks over 53 1/3 innings across three levels. Abreu earns plus grades for his fastball that has touched triple-digits, but he's yet to unleash that on anything above the Class A Advanced level. Wild card: Chris Shaw -- The Giants No. 2 prospect could be set for some monster numbers in the Fall League. With 88 games already in Triple-A, he'll be one of the circuit's most experienced position players, and he's got the pop (career-high 24 homers in 2017) to take advantage of some hitter-friendly environs in the Southwest. His biggest test will be continuing to improve in left field after moving there from first base. Otherwise, he should take quickly to the level of play in the AFL, and don't be surprised to see his name on some offensive leaderboards. Strength: Brewers prospects -- There are always going to be different strategies when it comes to who heads to the Fall League, but Milwaukee has taken the most fun path from our perspective by sending four of their top 18 prospects -- Second-ranked Ray, No. 10 Lucas Erceg, No. 14 Monte Harrison and No. 18 Jake Gatewood. Ray and Erceg -- both prominent 2016 Draft picks -- have something to prove after neither truly took off at Class A Advanced Carolina while Harrison and Gatewood will be trying to build off breakout 2017 campaigns that came three years after they entered the pros. Harrison, in particular, has the speed, power and arm that could really prop up his profile under the AFL microscope. They're two groups of prospects heading in different directions and should make for an intriguing follow, both individually and as a group. Weakness: Catching -- Salt River might be fairly low on our list here, but there aren't many individual holes on the roster. If there is one, it's behind the plate where Rockies No. 15 prospect Dom Nunez is the only ranked prospect. Nunez struggled some with the bat, hitting just .202 in 95 games with Double-A Hartford, but he has a good eye (.335 OBP) and can provide some pop (11 homers). His arm is his best tool, and it showed with a 33.8 percent caught-stealing rate. There's a good prospect there, but Nunez, Michael Perez (D-backs) and Rodrigo Vigil (Marlins) don't inspire the same amount of excitement as some other groups on the Rafters roster. Wild card: Ryan Mountcastle -- The Orioles No. 3 prospect shot out of a cannon by batting .313/.343/.542 with 15 homers in 88 games at Class A Advanced Frederick this season before hitting a bit of a wall (.222/.239/.366, three homers in 39 games) at Double-A Bowie. No matter, he still led the Minors with 48 doubles between the two spots and ranked fourth with 67 extra-base hits. What makes him a true wild card is that he'll continue his move from shortstop to third base in the AFL. The 20-year-old is showing his bat will play nicely, especially for his age, but Baltimore needs to find a position for him. They're hoping the hot corner will stick. Strength: Cardinals prospects -- The Cards are tied with the Yankees with five top-30 prospects heading to Arizona. That shouldn't come as a huge surprise as St. Louis has traditionally gotten aggressive with its prospects. Hard-throwing right-hander Sandy Alcantara (No. 9) will be the most well-known, not only because of his plus-plus fastball but also the fact that he has eight Major League appearances under his belt. Shortstop Edmundo Sosa (No. 12), right-hander Jordan Hicks (No. 14), outfielder Oscar Mercado (No. 18) and catcher Andrew Knizner (No. 27) round out the group. Knizner, in particular, has a real shot to make another jump after he .302 with 12 homers and a 45.1 percent caught-stealing rate in his first full season. Weakness: Star power -- You could already tell from the "None" above that there isn't much top talent on this roster. It's tough to point to a candidate from this group of organizations who should have gone though. It's just an unfortunate way the AFL puzzle came together for the Sags in 2017. That said, the No. 6 team in the Toolshed AFL Roster Rankings of 2016 was Scottsdale after it had just one Top-100 prospect. That prospect was Gleyber Torres, who went on to become AFL MVP. This spot isn't a death knell. Wild card: Tyler Jay -- Two full seasons in, it's tough to know what to make of the 2015 sixth overall pick. A reliever in college, the 23-year-old left-hander was initially used as a starter in the Minnesota system, only to be moved back to the bullpen last spring. Biceps and shoulder injuries held him back from throwing more than 11 2/3 innings in the regular season. He should be ready for a full load in the AFL, and with four pitches including a plus fastball and slider, he'll have more to work with than league's average reliever. If he can live up to his considerable potential in that role, that will leave room for optimism heading into the offseason. Anything less will only have everyone scratching their heads even more.